Let’s be clear that photoshopping vertebrae is an inexact science at best: I am working here from a single photograph taken carelessly as one among a hundred taken opportunistically in a museum too awesome not to photograph; I can see the vertebrae only from one angle; judging the maximal zygapophyseal overlap is error-prone. 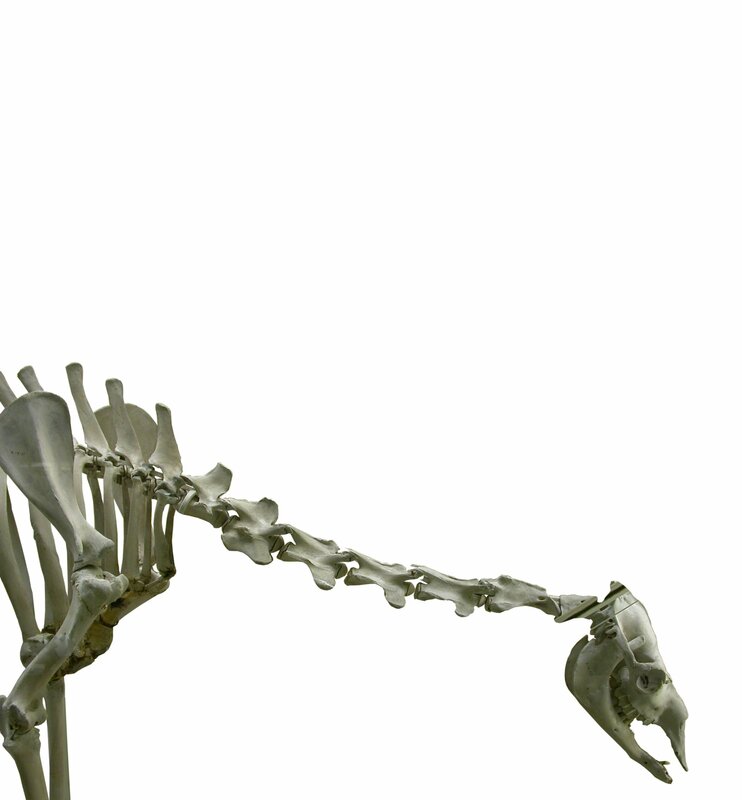 In comparison with the mounted skeleton’s pose, this re-articulates cervicals 3 and 4; but 4 and 5 remain horribly disarticulated, and the 5-and-6 and 6-and-7 pairs are now also in this state. Habitual posture (i.e. when the animal is not eating or drinking or otherwise doing anything in particular with its head) is somewhere above the mounted pose, but less extended than the raised pose shown by Maziersky. Nothing very encouraging, I’m afraid. 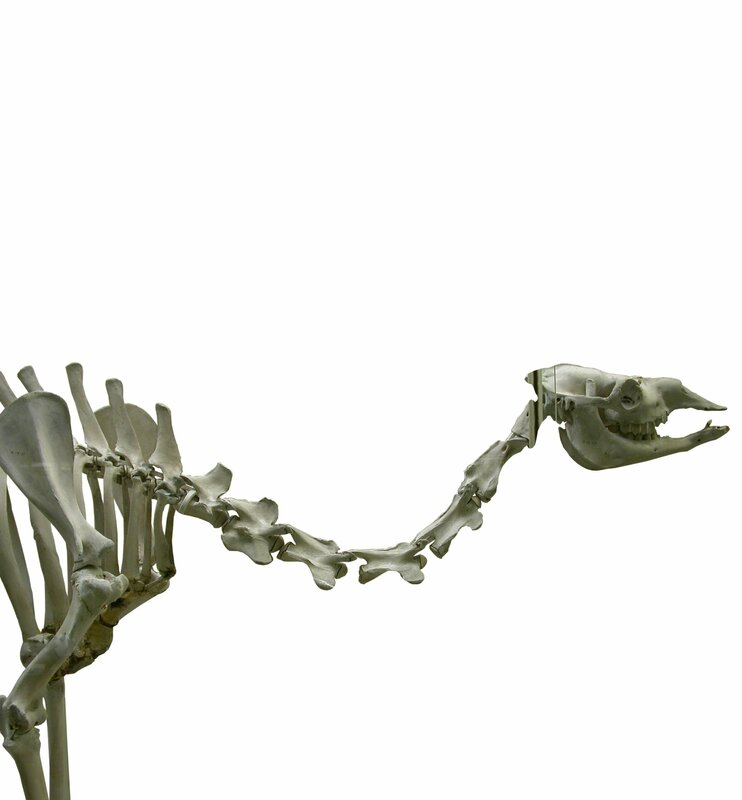 Even allowing for the vagaries of photoshopping images of museum mounts, it’s apparent that something very weird is going on in this camel’s neck, such that even a pose well below the habitual one requires extensive vertebral disarticulation. Assuming that, like me, you don’t believe the vertebrae really are disarticulating in life, we can only conclude that it is useless to try to reach conclusions about neck posture based on osteology alone. We need to understand the soft-tissue systems — especially the articular cartilage — as well. Stevens and Parrish (1999:798) stated that “in vivo, muscles, ligaments, and fascia may have further limited movement [i.e. 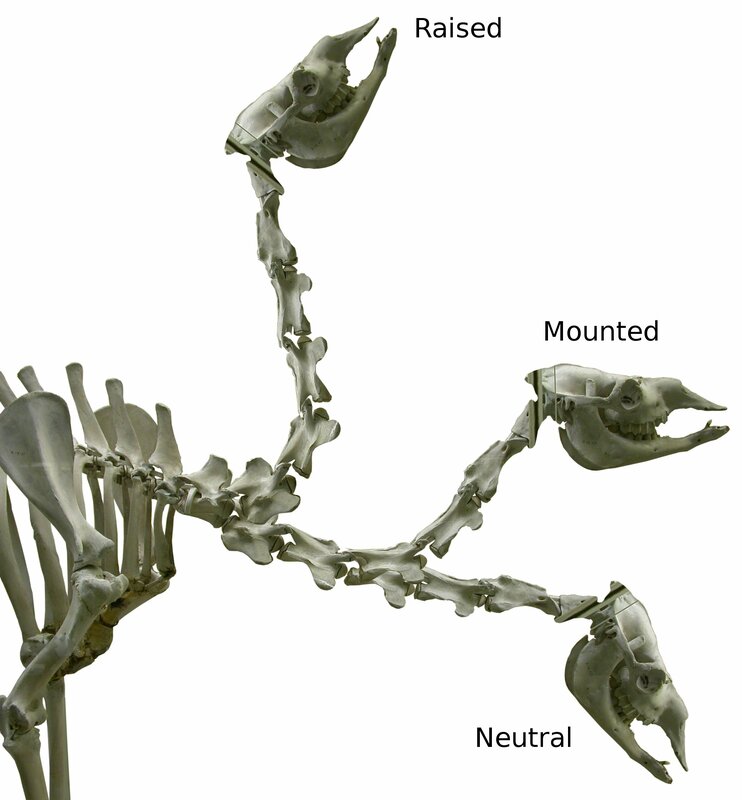 beyond the restrictions imposed by maintaining zygapophyseal overlap]; thus, the digital manipulations reported here represent a ‘best case’ scenario for neck mobility.” Although this seems intuitively appealing, evidence including but not limited to the Cambridge camel shows that the opposite is actually the case: in at least some taxa, and maybe all, soft tissue enables necks to be more flexible, not less, than the bones alone suggest. Folks, we’re flying blind. Until we start to understand the soft tissues in the necks of extant critters — especially the intervertebral cartilage, but I bet that’s not the whole story — we really have no idea how to interpret the bones. Come on, neontologists! Teach us about intervertebral cartilage! Maziersky, David. 2010. Anatomy of the Dromedary: Illustrating the world’s first atlas of camel anatomy. Halcyon 45:5-6 (June 2010). Stevens, Kent A., and J. Michael Parrish. 1999. Neck Posture and Feeding Habits of Two Jurassic Sauropod Dinosaurs. Science 284:798-800. Stevens, Kent A., and J. Michael Parrish. 2005. Neck posture, dentition, and feeding strategies in Jurassic sauropod dinosaurs. pp. 212-232 in: Virginia Tidwell and Ken Carpenter (eds. ), Thunder Lizards: the Sauropodomorph Dinosaurs. Indiana University Press, Bloomington, Indiana. 495 pp. Check out John Conway’s obscenely brilliant infinite-zoom Jehol video. (Well, a lot of people have been calling it infinite zoom, but it’s clearly finite. Still, it’s at least Very Big Zoom.) A lot of jaws dropped at SVPCA in Cambridge when John was showing this off. While you’re at it, you might like to read the interview with John at Dave Hone’s Archosaur Musings. Dave’s interviewed quite a few palaeoartists now, but John has more to say than most of them, and it’s well worth a read. While I was emailing with Darren about camels, he told me that John Hutchinson had recently acquired a camel at the RVC, and suggested that I ask to be present at the dissection of the neck. I contacted John only to be told: “Just got the feet; had no time to get the rest, sadly. Notice came at a bad time for my group, as it tends to do. It is now incinerated.” John also told me at SVPCA of a hippo that was recently incinerated because he couldn’t get to the zoo to collect it within 24 hours. Graaaggh! It’s a tragedy the dead animals that go to waste. Your ‘raised’ camel neck is well short of what is actually possible: camels can extend the neck much further than this, such that the dorsal surface of the head makes physical contact with the hump. Interestingly, there is a long (-ish) tradition of this being mentioned by dinosaur workers. 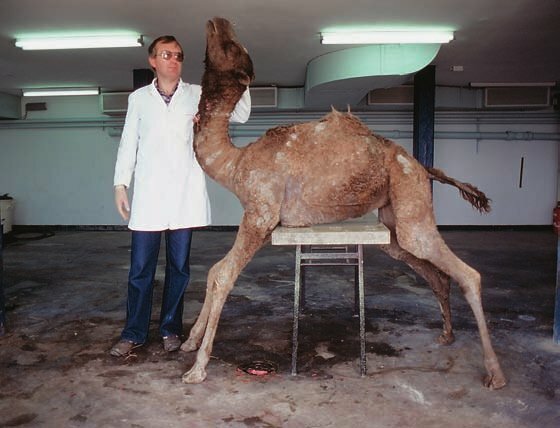 Back when _Jobaria_ was being spoken about by Jeff Wilson at SVP 1999 (I think), Wilson showed a photo of a camel in such a pose, noting that it made him sceptical of the (then new) conclusions of Stevens & Parrish. And at SVPCA this year, Kent showed a very similar image, though I can’t recall the context of its use. Incidentally, I have a photo of a camel standing bipedally. Yes, I’ve seen the picture you allude to, with the dorsal surface of the camel’s head in contact with the hump. (In fact I am pretty sure that either John or Kent showed that picture at SVPCA.) I initially planned to photoshop the mounted camel’s cervicals into that position, but it just seemed too ludicrous to believe in, and I’ve come to suspect that this picture might itself be the work of photoshoppers. At any rate, I couldn’t find it on Google Images. Does anyone have good evidence that the ability of camels to do this is true? Published photographs would be best, but a published account by a trustable author would be good, too. Personal experience would also get the job done. If anyone has good evidence that camels can really do this, I will make a fourth version of the Cambridge camel mount, with the head and neck in that position. I confidently expect it to be truly terrifying. Mike, you can see picture of the camel, with it’s neck extended over its back, in this talk from Stevens Dinomorph website. 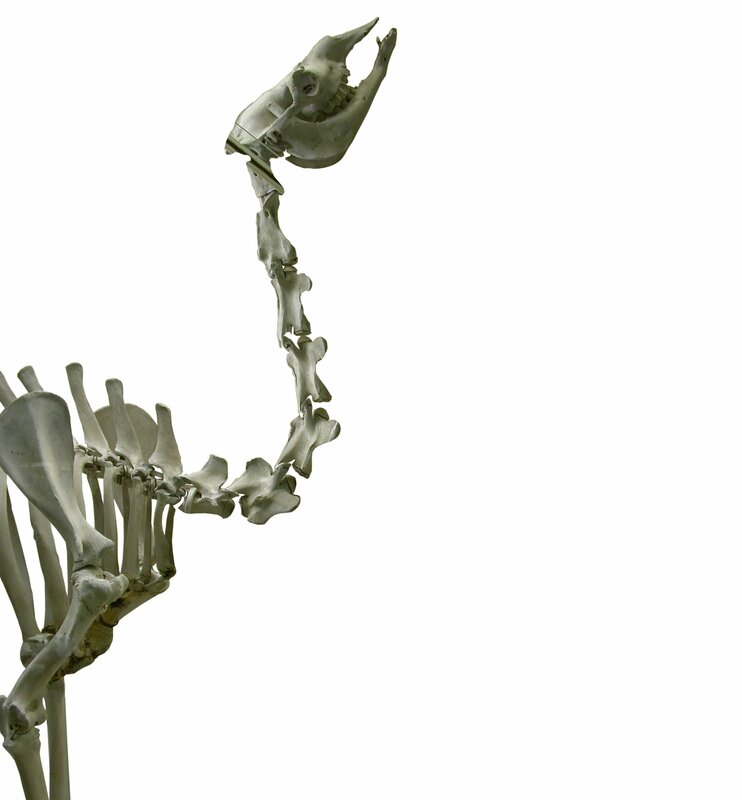 It also has the photoshop composite of the vertebra in that pose. That is a freaky pose. One thing that strikes me in the reconstructions is that C7 is in the same orientation with every pose, it seems like accommodating for the few degrees that intervertebral discs would add at both the anterior and posterior ends of the series would go some distance toward straightening everything out. It also seems like the range of motion is taking place between only 2 or 3 verts in each instance, surely much more of the neck is involved than that, right? I’m certainly not a biomechanics person, but it seems odd. Of course some of that must just be the limitation of a 2D reconstruction. While the following is not a common pose in life: http://www.vancouveryoga.com/assets/photos/backbend_fiona.jpg , it certainly isn’t an unusual one. Any idea what’s going on inside of her? One thing that strikes me in the reconstructions is that C7 is in the same orientation with every pose. Actually, no. I left it in the same orientation for the full-ONP reconstruction since it was already ideally articulated at both centra and zygs in the mounted pose; but I cranked it up a little in the reaching-up pose — as much as seemed credible given the small amount of information in the original photo. You can see this clearly if you tab back and forth between the different versions. It seems like accommodating for the few degrees that intervertebral discs would add at both the anterior and posterior ends of the series would go some distance toward straightening everything out. For sure the intervertebral discs are going to turn out to be very important in understanding neck flexibility. Someone’s going to have to do a lot of dissections to get this sorted out. It also seems like the range of motion is taking place between only 2 or 3 verts in each instance, surely much more of the neck is involved than that, right? I’m certainly not a biomechanics person, but it seems odd. Of course some of that must just be the limitation of a 2D reconstruction. Again, I made minimal adjustments in the ONP version, since the mounted skeleton seems to be in ONP already in all but two joints. For the raised pose, I introduced motion between more joints, but you’re right that I left the more distal ones as they were — they didn’t need adjusting to attain the depicted pose. They would need adjusting to get into the pose that Darren alluded to. Finally, I don’t know what is going on with abnormally flexible humans. In one sense I don’t much care, because postures like the one you linked to aren’t normal behaviour and aren’t attainably by most people; on the other hand, knowing what the mechanical limits are, and exactly what is different about super-flexible people that enables them to do such things, might shed some light on normal posture is some weird animals. Hi, Henry, great to hear from you! No, the anterior thoracic vertebra is not guilty here: I did want to take it into account, but rather than try to photoshop it from its awkward position surrounded by the rest of the skeleton, I allowed for it having maybe 15 degrees travel upwards from the mounted pose, and correspondingly reduced by 15 degrees the extremity of the raised posture that I used. You can get an idea by just grabbing the whole of the front of the animal, from head through to first thoracic, and rotating it all fifteen degrees anticlockwise.